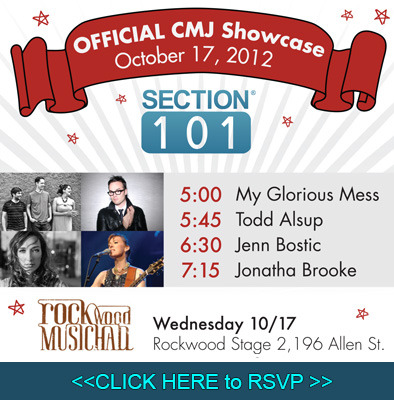 SECTION 101 IS PROUD TO ANNOUNCE OUR FIRST CMJ MUSIC SHOWCASE! Section 101 is proud to announce our first official CMJ music showcase at Rockwood Stage 2 in New York City [196 Allen Street between Stanton and E. Houston Street] on October 17th from 5pm to 8pm. The line up is made up entirely of Section 101 powered artists including: My Glorious Mess Todd Alsup Jenn Bostic Jonatha Brooke Along with the amazing showcase, Section 101 is participating in many other CMJ activities, including exhibiting in Kimmel Hall at New York University. Section 101 will also be hosting website building workshops at our branded re-charge stations, where coffee, water and snacks will be provided along with proven tips and advice on how to make your brand stand-out online. Finally, mark your calendar for CEO Liz Leahy’s speaking engagement on the Gaining Online Traction: The Art of Creating the Perfect Musician’s Website panel, Tuesday October 16th at 12:30pm at NYU Kimmel Ctr. Room 802 Shorin.  As moderator, Liz will be joined by Dave Cool from Bandzoogle, Jessica West of UNIPHI GOOD, Hadaya Turner of Hadayalive Entertainment and Michael Shoup of 12South Music. ABOUT SECTION 101 Section 101 delivers a dynamic web-based platform that presents simple and effective solutions for music and entertainment brands to manage and maximize their online presence. Section 101 enables clients to create beautiful, personalized websites that are easy to use, while providing a powerful suite of integrated tools designed to organize and leverage their fan base across a growing number of online and social channels. Section 101 offers a premier service for clients who prefer Section 101 to supply creative input – from design and development through to the successful launch of their websites, as well as a Do-It-Yourself model, providing all the tools and functionality required for clients to create their own unique website on a budget. Leading music artists and brands like Aimee Mann, Duran Duran, BUSH, Kina Grannis, Diane Birch, Rachael Yamagata, Kicking Daisies, Corey Taylor (Slipknot), Junip, Early Winters, DJ Eliot Lipp, Readymade Records, Robot of the Century Music Publishing, Radio Woodstock, B|W|R Public Relations, the Rube Goldberg Estate and many others rely on Section 101 technology to power their digital presence.